This was an okay story but the writing style was different and it made it very difficult for me to get into the story. It’s written almost diary style, which I didn’t much care for. Violet is the oldest of 3 girls in her family and she has Hyperthymesia, the ability to recall anything she’s ever seen, heard, or experienced. Violet is a teller at a bank and her favorite day of the week is Wednesday, when the oh-so-hot Jordan Pike comes in to make his weekly deposit. Pike has a dream of becoming a detective but in the meantime is stuck working as a male stripper. The only bright spot in his week is seeing the Violet, the woman whom he longs for but hasn’t gotten up the nerve to ask out. He knows that Violet isn’t one-night stand material, she’s a forever type of girl and he’d like to give that a try. The chemistry between the two is undeniable and though it’s slow going in the beginning, once they get into things it steams up pretty quickly. This was a sweet story and I enjoyed Violet and Pike’s banter back and forth, it’s what kept me reading through until the end. I also love that I didn’t catch on to Pike’s “secret” until pretty far into the book, I like when authors are able to keep things a surprise. I did like this story, but the blurb quite literally summed up the whole book. It was everything the blurb said, but not much more. I expected a little more intrigue with Violet's ability and maybe a little more action from Pike's side of things, but it wasn't there. I really liked their chemistry, the witty exchanges, and their romance was definitely entertaining. Overall, I found it to be an okay read. I have to admit that I am not usually into books with large sections of inner monologue, but here it feels more like a discourse with the reader, and so somehow worked better. The humour helped, for sure! If you are looking for a sweet romantic read, with plenty of funnies, and a quirky lead couple, then this would be a good buy. I wasn't convinced that they behaved their ages, being genuinely immature, rather than just choosing to be so – but if you ignore their stated ages, it is easy to ignore. The old issue of lack of communication is definitely given a run for its money here. I enjoy reading something different, and this worked for me. I am curious to see what Ms. Saperstein writes next, as she has set the bar at a cute and quirky level. Follow the Naked Truth Blog Tour HERE. 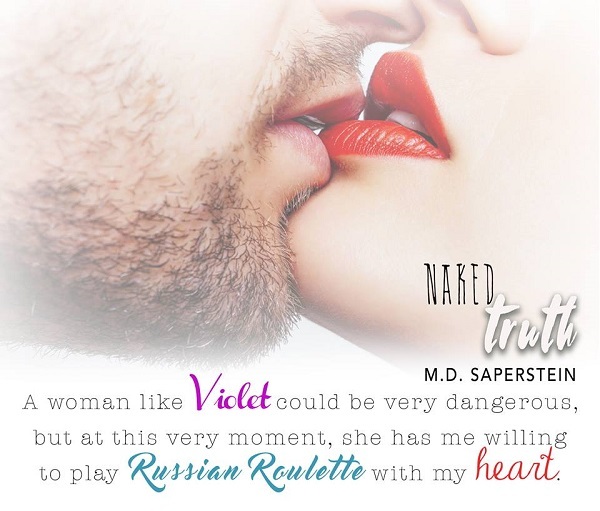 Reviewers on the Wicked Reads Review Team were provided a free copy of Naked Truth by M.D. Saperstein to read and review for this tour. Thank you for reviewing and hosting NAKED TRUTH today!